We had a BUSY weekend between the last Mass with our music group and a second round of Easter with Nate's family. Not to mention, we like to jam in as much family time for our little family of three too! So, because my brain is a bit mush today, I'll just share our weekend in photographs! Friday was the first nice day we'd had all of last week, so Ollie and I waited outside for Nate to come home and played around in our yard a bit. We gotta get this kid some outdoor toys stat, but he still liked running around and playing with leaves in sticks in his too big for him Elmo hat. I can't believe how much he looks like a little boy here. 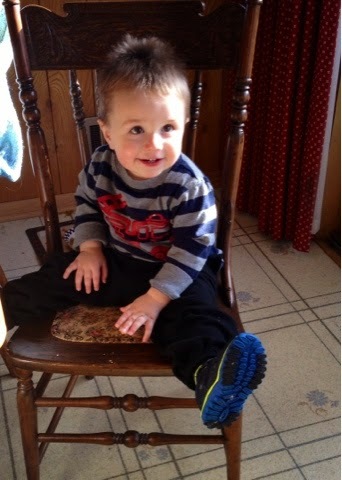 Sitting in a big boy chair waiting for dinner (supervised, he still sits in a high chair to eat). Ollie and I enjoyed some Saturday morning snuggles. 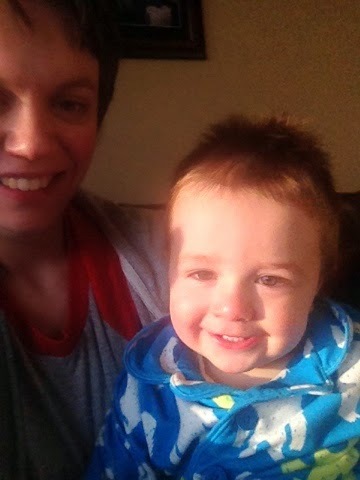 I can't resist him in his fuzzy pajamas, I want to give him all the cuddles. Most of the time he resists, but when he's willing, we snuggle. We went to our Science Museum for a bit on Saturday morning. 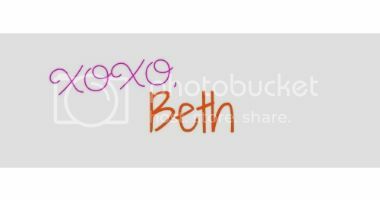 We have a membership, but haven't used it much since we got our Children's Museum membership. We wanted to give Ollie somewhere different to run around, so we decided to give it a go. He wasn't super impressed, but still had fun running around a bit. 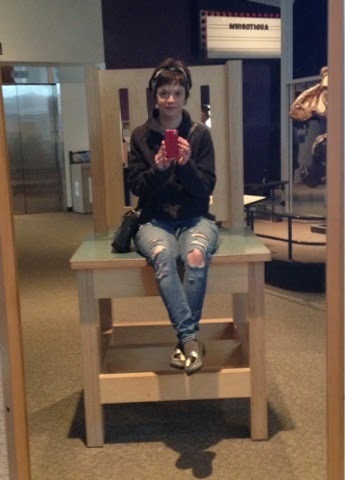 I found a chair I think I need in my house, what do you think? Sunday morning we got up and played our first round of disc golf for the year. Ollie rode in his stroller for a little bit, but decided to get out and play a bit too and loved it. We brought his little mini-discs and he thought he was pretty cool. 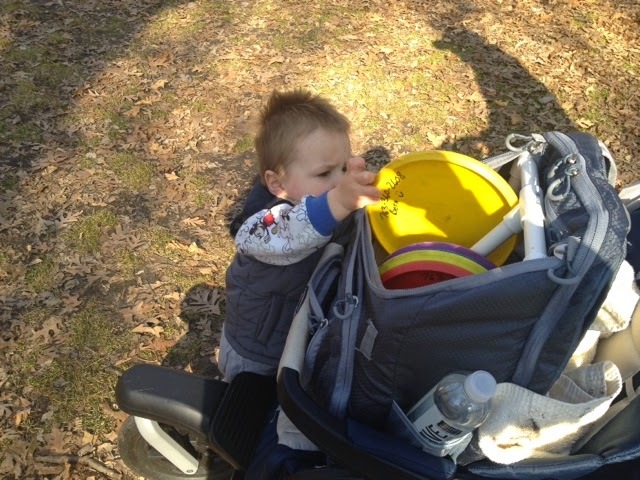 He eventually decided his little discs were no fun and wanted to go for mommy and daddy's discs instead! 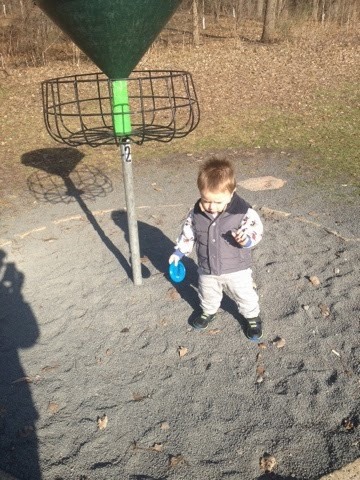 I'm pretty impressed, he didn't slow us down too much and walked probably eight of the twelve holes at the park. He had a lot of fun. Later on Sunday morning we celebrated Orthodox Easter with Nate's extended family. Even though his grandfather, the only relative who was actually Russian Orthodox, is no longer with us, we keep this tradition up in his honor. 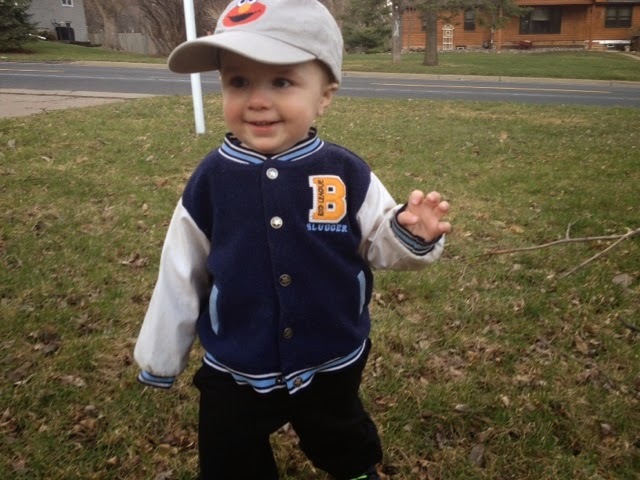 It was nice to see a bunch of the extended family we haven't seen in awhile and Ollie had fun looking for Easter eggs and playing with his bigger cousins. He took a nice long nap after his exciting morning! This last picture, while blurry, makes me laugh. After his nap, we were cleaning up Ollie's room a bit and put away our latest order of diapers (buying them by the case is such a good way to go!) 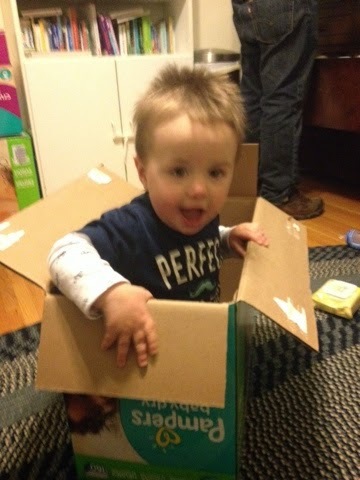 and he was being goofy and playing in the box. He laughed so much he gave himself the hiccups. We ended our weekend with a walk in the park and burgers on the grill for dinner. We all slept pretty dang well last night after our busy weekend and so much time outside! How was your weekend?